No. 1042 is a 2000°F (1093°C), gas-fired heavy-duty furnace from Grieve, currently used for heat treating at the customer’s facility. Workspace dimensions of this furnace measure 30” W x 60” D x 30” H. 750,000 BTU/HR are installed in four modulating natural gas burners with a floor mounted combustion air blower. Burners fire below hearth, with 9” thick insulated walls comprising 5” thick 2300°F ceramic fiber, 4” 1900°F block insulation and 8 1/2” floor insulation made from 4 ½” of 2300°F firebrick and 4” of 1900°F block insulation. This Grieve furnace has two lanes of roller rails supported by firebrick piers and an air-operated platform with roller rails to bridge from loading table to workspace. Features include a ¼” plate steel exterior reinforced with structural steel, ½” steel faceplate at doorway and an air-operated vertical lift door. Other features include safety equipment required by IRI, FM and National Fire Protection Association Standard 86 for gas-heated equipment plus a free-standing 390 CFM high-pressure combustion blower. Controls on the No. 1042 include a digital indicating temperature controller and manual reset excess temperature controller with separate contactors. No. 866 is a 550° (288°C) belt conveyor oven from Grieve, currently used for heat treating coiled spring steel at the customer’s facility. Workspace dimensions of this oven measure 18” W x 20’ D x 15” H. 60 KW are installed in Nichrome wire heating elements to heat the oven, while a 4200 CFM, 3 HP recirculating blower provides vertical downward airflow to the workload. The oven travel comprises an 1-1/2’ long open belt loading zone, 20’ long insulated heat zone with recirculated airflow, 1’ long open zone, plus a 12’ long cooling zone and an 1-1/2’ long open unloading zone. 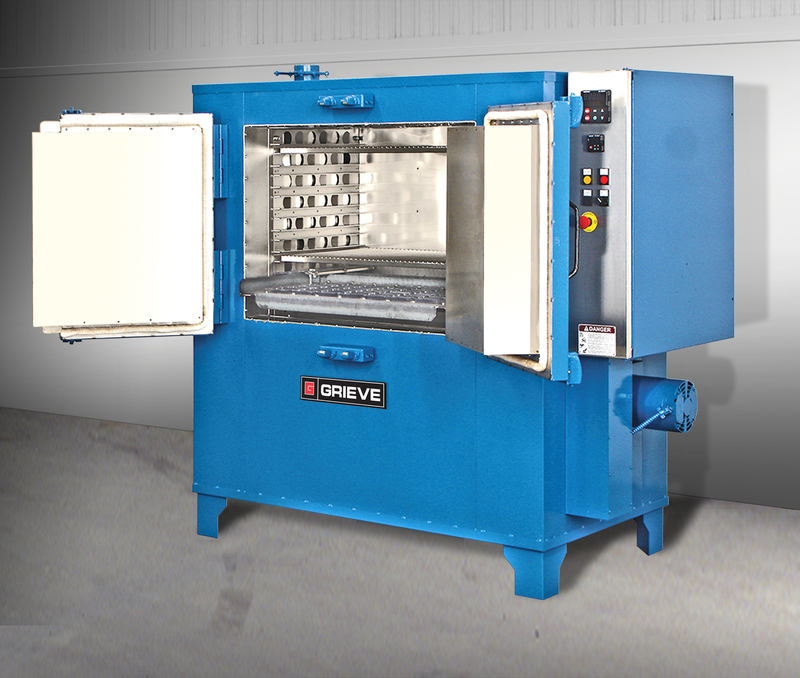 This Grieve belt conveyor oven features 4” insulated walls, aluminized steel exterior and stainless steel interior. Two 12” diameter tubeaxial fans, each driven by a ½ HP motor, push/pull air through cooling zone and a 12” wide, ½” x ½” high carbon steel flat wire conveyor belt with 1/3 HP motor drive, variable from 16 to 44 inches per minute, are also onboard the oven. Controls on the No. 866 include a 10” diameter circular chart recording temperature controller and a manual reset excess temperature controller. No. 868 is a 500°F (260°C), high-temperature special top-loading oven from Grieve, currently used for testing oil field downhole equipment at the customer’s facility. Workspace dimensions of this oven measure 185” W x 18” D x 24” H. The oven features 34.8 KW installed in Nichrome wire heating elements, while 4000 CFM total from two 2-HP recirculating blowers provide horizontal front to rear airflow. 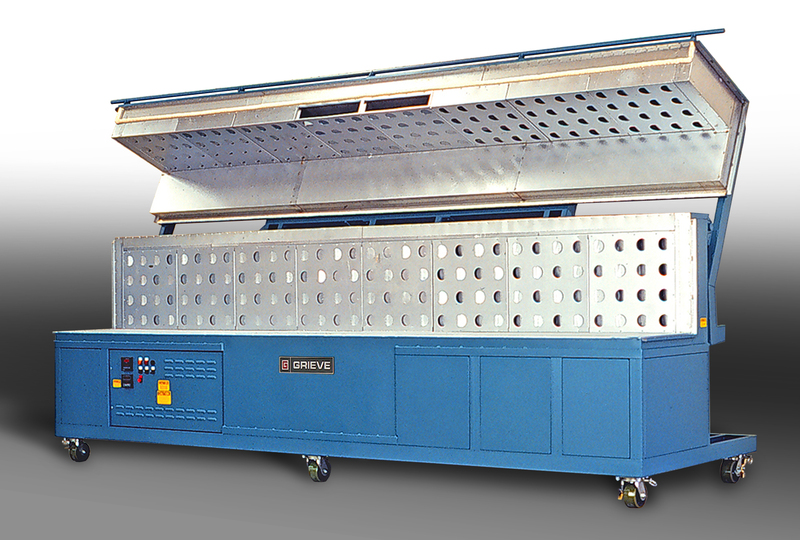 This Grieve special top-loading oven features 4” insulated walls, aluminized steel interior and exterior, plus reinforced ¼” steel plate workspace floor designed to hold 3600 lbs. distributed load. The oven is supported on six swivel casters with swivel locks and brakes and has a motor-operated, rear-hinged door. Controls on No. 868 include a digital indicating temperature controller, a manual reset excess temperature controller with separate contactors and a recirculating blower airflow safety switch. No. 1039 is a 2000°F (1093°C), inert atmosphere, heavy-duty furnace from Grieve, currently used for heat treating turbine components at the customer’s facility. Workspace dimensions of this furnace measure 36” W x 60” D x 36” H. 73 KW are installed in ICA wire coils supported by vacuum formed ceramic fiber installed on all interior surfaces, including door and beneath the hearth. 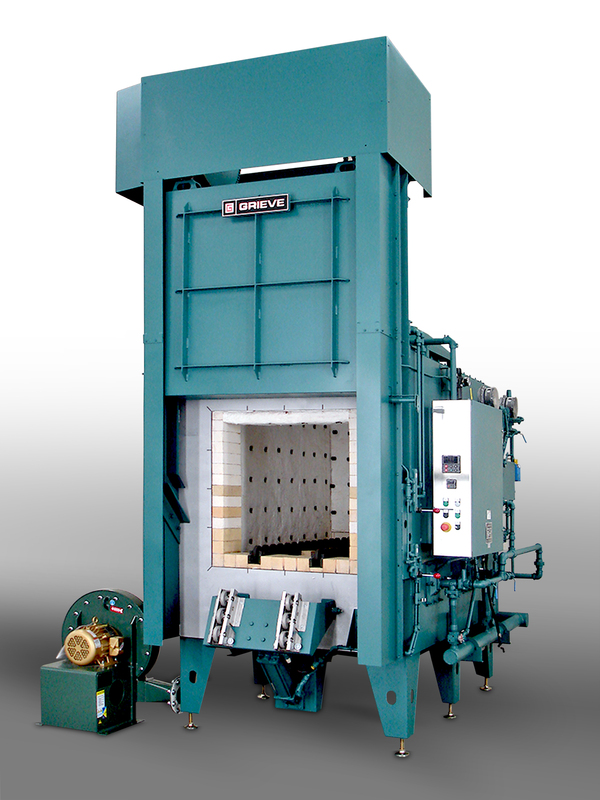 This Grieve inert atmosphere furnace has a roof-mounted, heat-resisting alloy circulating fan powered by a 1-HP motor with V-belt drive, water cooled bearings and inert atmosphere shaft seal. Furnace features include 9” thick insulated walls comprised of 5” of 2300°F ceramic fiber and 4” of 1900°F block insulation; 8 ½” floor insulation comprised of 4 ½” of 2300°F firebrick and 4” of 1900°F block insulation. Other features include ¼” plate exterior reinforced with structural steel, ½” steel face plate at doorway with air-operated vertical lift door. Inert atmosphere construction includes continuously welded outer shell, high-temperature door gasket, sealed heater terminal boxes, inert atmosphere inlet, inert atmosphere outlet, inert atmosphere flow meter and manual gas valve. Controls on No. 1039 include a digital programming temperature controller, a manual reset excess temperature controller with separate contactors, paperless event recorder and SCR power controller.